Our kids would beg for a dog and I'd say "it's a dog or me, your choice!" First off, I thought I was allergic to dogs, and second, I thought of a dog as just another thing I'd need to take care of. I was actually 'anti dog.' If you brought your dog to our house it had to stay outside. I didn't know the names of my friends dogs. Dogs simply didn't matter at all to me. So when I had my 'dog awakening' it was a pretty huge life change. 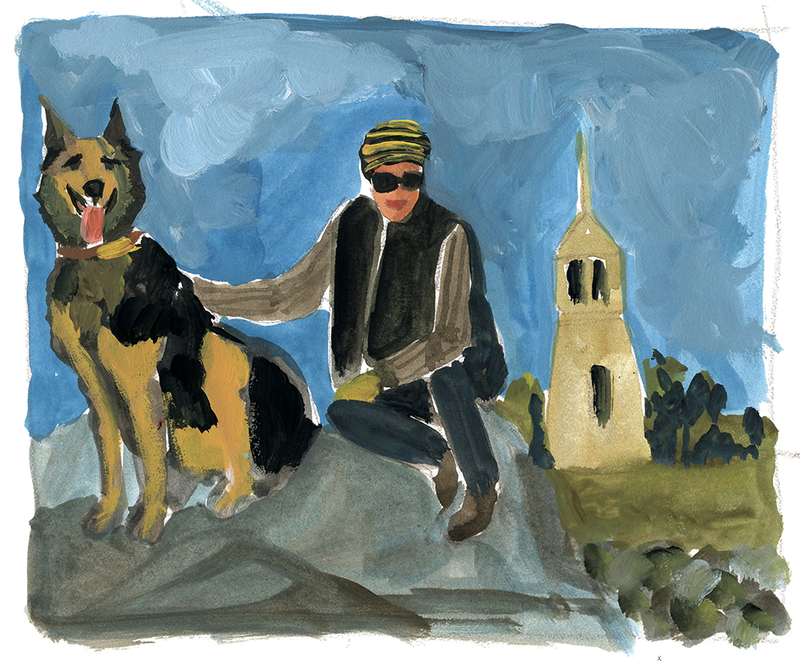 It all began with Ike, the German Shepherd - Rottweiler my musician daughter Sonya 'dog shared' in Brooklyn. Ike was her neighbor's dog. Sonya began jogging and dog sitting Ike and after the neighbor had a baby and moved across town, Ike began to live with Sonya part time. The first time Sonya brought Ike home it was love at first sight. And I had no allergic reaction. So began my new life as a dog person, and the 8 month hunt for OUR dog. Me and Ike on The Great Island, Cape Cod. I really wanted a German Shepherd. Actually I really just wanted another Ike! We came close with a one year old GSD that we went to meet at an apartment in Springfield, MA. He was kept in a bedroom where the whole wooden door was destroyed from him scratching at it. The owners had to find a new home for him because he barked all day while they were gone. It was tragic all the way around. For the owners who loved him, and for the dog who should not have been cooped up all day. I thought our 50 acres in the country would be perfect! They brought him for a visit and I saw that my husband Peter and son Max really liked this wild teenager of a dog - but he made me really nervous. The owners left and never called us back. I was relieved. I knew he was too much dog for me. In the meantime, I was getting to know my friends dogs and learn their names. I started dog sitting our neighbors dog Lexi. I like to call Lexi my 'starter dog'. I used to jog by their house and stop to pet Lexi if she was outside. I loved how she became so excited to see me! When I realized they were moving in a few months to be closer to work so they'd not have to leave her for 8 hrs at a time, I offered to pick her up on my morning jog and keep her until they came home. For free! This was great for all of us! I loved jogging with her and having her in my studio at my feet. I was sad on the weekends when I didn't have her. Lexi, Max, Me. Ike and Sonya on a hike for Peter's birthday. Ike would be gone about one month later. Life as a 'dog person' was a whole new way of being in the world. I stopped to pet dogs and talk with the owners. I also spent a lot of time on Petfinder and making visits to shelters looking for 'our' dog. In November of 2012, Ike suddenly died. It was such a traumatic experience for Sonya. Getting someone to help her carry this over 100 lb dog into a cab, having to put him down, bringing him home and keeping him on ice in her bathtub for a day until the owner flew back from a trip. They drove Ike upstate to have a ceremony and burial for this magnificent beast who was beloved by so many people. I get teary just writing these words! I was blindsided and very surprised by the grief I felt at Ike's death. I've lost both parents to cancer, and many friends to Aids. I was shocked that this grief felt similar to the human grief I knew too well. And Ike wasn't even my dog! Part of it was feeling Sonya's grief, and part of it was my own, as I had formed a bond with Ike. I once drove two hours EACH way to pick Ike up while Sonya was on tour so I could have him to myself for 3 days. Sonya walked the streets of NYC with Ike off leash and took him everywhere. Ike was her protector. Me and Charlie. He's not sad OR scared. It's just his face. Soon after Ike's death we went to The Simon Foundation about 1 1/2 hours away. You had to fill out an application and give references to come to this shelter. They brought dogs they thought could be right for us into a private room, sparing us the tortuous 'kennel/cages walk'. 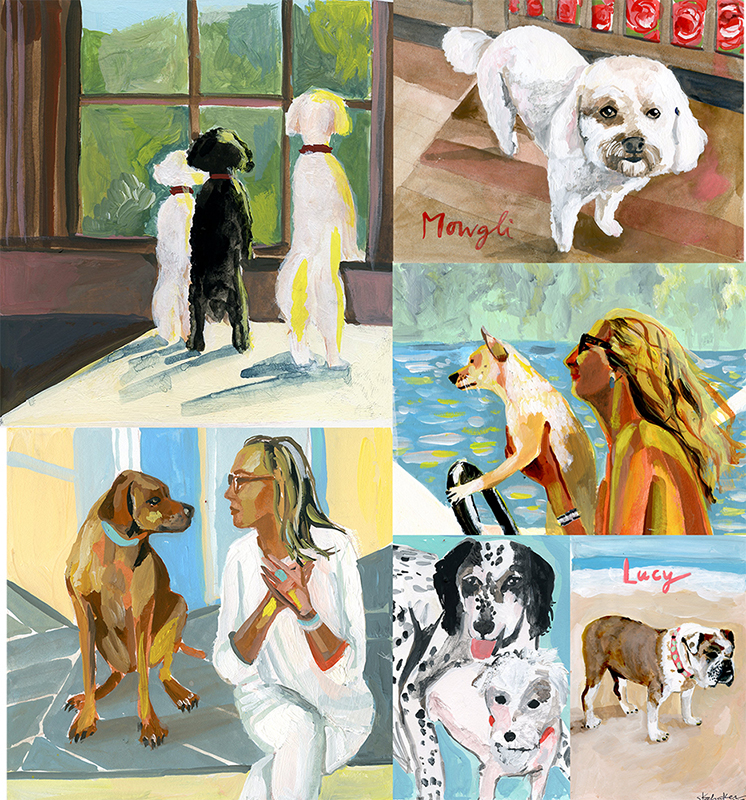 I was drawn to one dog, and Peter and Max liked another. We couldn't make a decision so they suggested we leave and think about it. The next day Peter said, "I keep thinking about that dog Hunter, and I could imagine him in our life." And Peter didn't even want a dog! He was going along with it for me. Hunter was nothing like the dog I'd imagined, but I went back two days later when they re opened with my friend Ann, a highly qualified, long time dog person. I needed a pro along with me for this huge decision. I asked the universe to give me a sign that this dog 'Hunter' was the one for us. When they brought Hunter out and he lovingly bonded with Ann she looked up and me and said " Gaaaaaaayle... he's perfect!" I went to the counter and asked to see the paperwork and... that's when I got my sign from the universe. His birthday (totally random of course as he was a rescue from the south) was October 17. PETER'S birthday. Max wanted to name him Dante. I agreed, but after after a few days I said he doesn't seem like a Dante. He feels like a Charlie. This was five years ago, Dec. 5 2012. Lexi's family moved the NEXT day. I had one day with both dogs. Talk about perfect timing! Charlie has kinda become my muse. I paint Charlie as often as I can. He's learned how to pose really well for photos. Sometimes he looks regal, other times he looks really sad. He's always very patient with me. This past Halloween I painted Charlie as SLD - Super Lover Dog. We have a seasonal 'glamping' Airbnb and one of the big perks is people can bring their dogs. We've met some wonderful people and Charlie gets to hang out with some really great dogs. While I'm pretty sure Charlie loves me BEST, he actually 'loves up' anyone who wants/needs it. It's not uncommon for a guest to say how snuggling and walking with Charlie was one of the best parts of their time at our Pondhouse. Guests routinely talk Charlie up in our reviews. "Gayle and Peter couldn't have been better hosts but the real rockstar of our stay was Charlie, a truly amazing and unique dog who really made it hard for us to leave." Kids adore him and no matter what any small child does to him he is always very gentle. This little girl was giving him a 'massage.' It's a whole other ball game when he's on the hunt for anything with fur in the woods. He once even tree'd a small bear. Charlie with visiting dog guests. Once in a while he helps make my social media posts a bit more interesting. 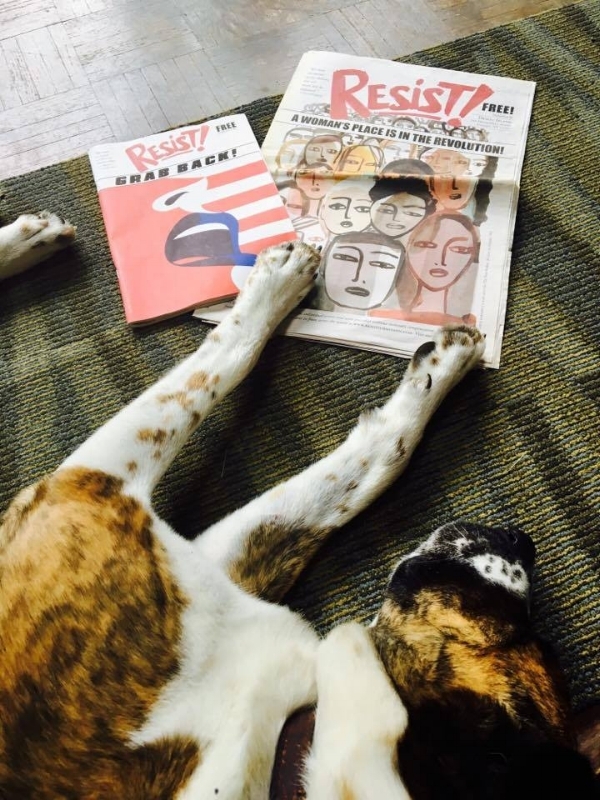 The caption for this read something like Charlie is exhausted after reading BOTH issues of RESIST! I am commissioned fairly often to paint dogs that have died. 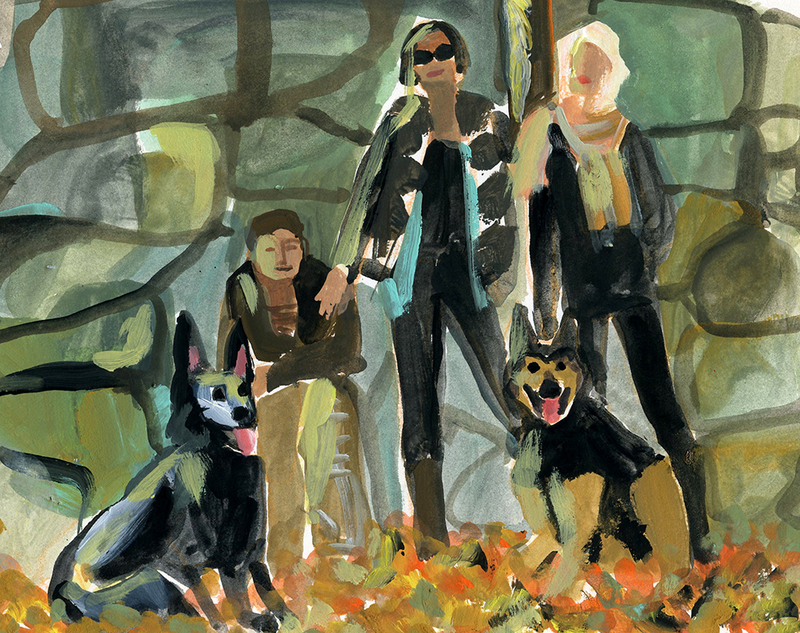 I feel a special connection to these dogs when I paint them. I imagine their eyes looking lovingly into their owners eyes. I 'ask' the dog to help me to catch their spirit. Seems to work! I cannot imagine life without Charlie and I just hope the inevitable is not for MANY years! And now I cannot imagine life without a dog. That unbridled happiness and unconditional love? I never want to be without that again. I firmly believe having a dog makes me a happier, healthier, kinder, and in general nicer person. Peter and I laugh more because of Charlie. Around the same time we got Charlie, I started buying and not killing plants. And I became vegan. So, now I am a vegan, dog loving person who is able to keep plants alive. Who knows what else could happen? Anything is possible. This story is lovingly dedicated to Ike and Sonya for turning me into a dog person.